Forecast Pro Unlimited is a versatile sales / demand forecasting software solution designed for businesses that need to forecast more than 100 items (can be 100s or even 1000s) and also need collaborative forecasting, working with complex hierarchies, maintaining multiple forecast overrides, documenting your forecasting sessions and integrating with other systems. With Forecast Pro Unlimited, forecasting thousands of SKU’s is as easy as selecting a data file and clicking the forecast icon. With a few additional clicks of the mouse, you can graph the results, view forecast reports, make judgmental overrides and save the results. 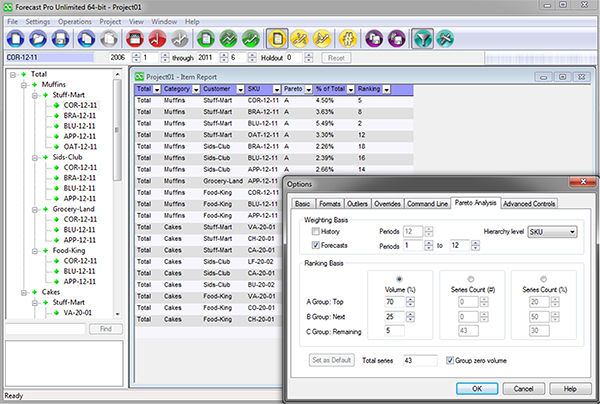 Forecast Pro Unlimited’s Expert Selection mode analyses each item and selects the appropriate forecasting method automatically. If you prefer to specify the forecasting approach, Forecast Pro Unlimited provides a complete range of forecasting methods and all the diagnostic tools you need. Incorporating business knowledge is often essential to establish the final forecast. Forecast Pro Unlimited’s override facility allows you to adjust the statistical forecasts in a spreadsheet-like display which shows both the historical data and forecasted values. You can adjust single points, ranges or totals, using percentages, increments or by simply entering new values. If you’ve defined a multiple-level hierarchy, adjusting a value at any given level will automatically adjust all appropriate levels. Working with colleagues can also improve the forecasting process. Using up to ten customizable override rows and handy comment fields, you can easily collaborate with your colleagues and document your changes to foster a truly collaborative forecasting process. Using the powerful combination of Pareto analysis (ABC classifications) and report filtering, you can streamline your forecast review process and save time. Forecast Pro’s automated Pareto analysis gives you the flexibility to assign ABC classifications to the items you are forecasting in a number of ways based on volume (either historical or forecasted) or series count. Further, you determine at which level of the hierarchy to assign ABC classifications and which periods to analyze. Integrating Forecast Pro Unlimited with your existing software systems is very straightforward. You can import data in a variety of flexible, easy-to-create formats including Excel spreadsheets, text files and ODBC. You can also customize the content and format of the output. Whether you need a flat file to feed your ERP system, a spreadsheet for a colleague or a presentation-quality report to pass around the board room, Forecast Pro Unlimited’s flexibility makes it simple to get the information you need. Most forecasts need to be updated on a regular basis (often weekly or monthly). Forecast Pro Unlimited allows you to save and restore your forecasting sessions including the forecasting models used, the forecast overrides and their associated comments, and all of your reporting options. Returning to your forecasting session at a later date to continue your work, updating your forecasts when new data become available and sharing your work with colleagues it’s all a breeze with Forecast Pro Unlimited. a sustainable forecasting system that can be easily transferred to new team members. Forecast Pro Unlimited Collaborator licenses provide an easy and affordable way to collaborate with colleagues. Offered at a fraction of the cost of Forecast Pro Unlimited Forecaster licenses, Collaborator licenses allows others to view your forecasts including graphs and reports add overrides and comments, and save the results. To download a product brochure, look at online demos or organise a live demo please click .